No issues on 1060 and 1070, but its not working steady on my regular 1080's. Could be because of different memory, but it would be great if I could use it on all my rigs. i got rejected shares on nicehash. if you have time @dstm can u please check that. i love your miner. didnt give me a hard time unlike ewbf. no 0 sols problem on dstm. - 378 vs 384 vs (other versions) vs CUDA Toolkit? I can confirm there are rejected shares on NiceHash with any PL\Freq settings, even stock. Can you please look into it? 'cause I'm using it only on NH, and maybe some other folks too. Also I think you must do something to improve readability of information in miner window. What do you thing? To my mind, currently there are too many informations in the console. In my version summary for GPU(s) will appear every X minutes or shares . "+++++" instead of number is strange ideaso I changed it. More info would be avaible via telemetry. @dstm, can you consider adding new equihash variant, e.g equihashzero k=192 n=7 ? @Atexor..... How did you got that picture dstm miner is closed source ! I gota that problem too. And dstm want help you. I got same error time to time on BTG. I would add in miner window also power consuption in Watts. It's really useful. Okay, I'm bad at math, but not that bad. Still, it would be nice to see the power draw for each card. I am using v0.5.4 version of miner and now try v0.5.6 and cant seen any difference in cpu usage. And speed of mining are as i can se almost same. 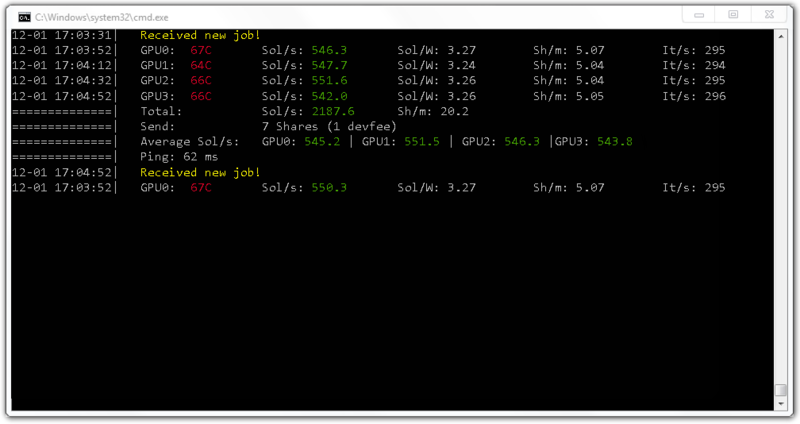 Look like need some work on cpu consumption becouse other similar miners use take lower usage on cpu. For my test, I did see a slightly higher hashrate for GTX 1060. But with 1070, it looks like the same. By the way, It's more stable when I use ver.0.5.6 and update window 10 to ver.1709 Fall Creator. With ver.0.5.4 and window 10 ver. 1703, miner was unexpected closed many time. Is there anyone who also have connection problems to NH pool when using this miner?